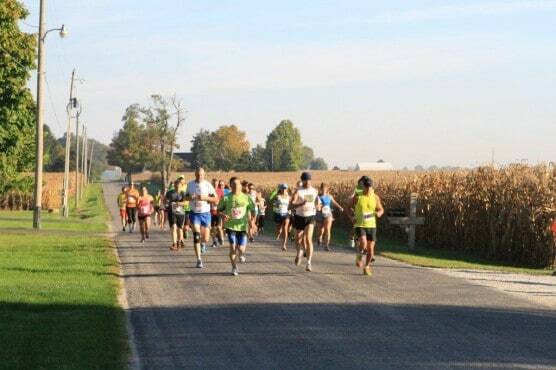 With a course that takes runners on a largely fast and flat course along rural country roads here in central Indiana, Flora’s Adams Mill Covered Bridge Half Marathon & 2-Mile Run makes its 8th annual running this fall. The highlight of the half marathon race is a run through the Adams Mill Covered Bridge, one of a number of historic bridges across the state, whose history here in Indiana’s Carroll County dates back to the early 1870s. Runners start both races in Flora’s Town Park, which lies just east of downtown in this small town of just over 2,000 residents about an hour’s drive north from Indianapolis. From there, the half marathon route follows an out-and-back course that mostly unfolds along a long straightaway stretch down County Road 50 E, leaving the park and heading south. There’s a quick detour with a right turn on Jackson Street, followed by a left on Wayne Street and another left on East Adams Street before turning right again to re-join 50 E.
For the next four miles, runners then head south in the direction of Wildcat Creek, the winding creek that flows through the rural farm fields just south of Flora. After the course crosses East 400 South, the road then veers to the left along some rolling hills as it nears the bridge and crosses the creek, taking runners through the Adams Mill Covered Bridge for which the race is named. Listed on the National Register of Historic Places, the 1872-era Howe truss-style bridge has a long (obviously!) history here in southeastern Carroll County, and the fact that it’s still standing is testament enough to the affection many local residents have for it. Originally built to ease the minds of nervous horses about to cross the creek (and presumably block out thoughts of the water below), it was closed for about 30 years, until it was restored in the late 1990s and re-opened to traffic in 1999. Today the bridge is part of a 50-acre protected wetland called the Adams Bridge Oxbow Natural Area, which features a one-mile walking trail through the wetlands area. Runners will make their way along the roadways around the area, making the turn at the post office in Cutler, and then heading back along the exact same route they ran in the first half, all the way back to the finish line in Flora Town Park. Runners on the course at the 2013 Adams Mill Covered Bridge Half Marathon. Proceeds from the race will go to benefit the youth and family programs at Flora’s Carroll County Community Center, which is also organizing and sponsoring the race. Want to know what the area looks like? See photos of the Adams Mill bridge here. Located in central northern Indiana, about 25 miles northeast of Lafayette and roughly 65 miles northwest of Indianapolis, Flora typically sees October temperatures that average between 42°F and 66°F, while rainfall totals average 2.7 inches for the month, making October its fifth-driest month of the year. See the race route map for the Adams Mill Covered Bridge Half Marathon here. To reserve your spot in the 2018 running of Flora’s Adams Mill Covered Bridge Half Marathon or 2-Mile race, register online at GetMeRegistered.com. Ever run in the Adams Mill Covered Bridge Half Marathon? Share your impressions here, or post your review in the Comments box below. I’m sure that I’ve just overlooked it but where and what times are packet pickup? Is this a walker friendly event, what is the time limit & do all participants receive medals?